Legacy 2030 | Winston-Salem/Forsyth County Planning Board: How have Legacy Rural Area programs worked? How have Legacy Rural Area programs worked? There have been a number of successful actions supporting the preservation of the Rural Area since the adoption of the 2001 Legacy Plan. The Revised Planned Residential Development (PRD) ordinance increased the amount of open space required to be set aside as part of a PRD (a minimum of 45% of a development site in RS-30, RS-40 and AG zoning districts). The ordinance also requires different types of open space to be set aside, including passive open space (natural areas such as floodplains and steep slopes), active open space (such as neighborhood greens and playgrounds), and landscape buffers along major roadways. The new PRD regulations provide a way of implementing the Open Space Subdivisions recommended in the 2001 Legacy Plan to preserve farmland and rural character. The new Voluntary Agricultural District (VAD) provisions encourage the economic health of agriculture, increase protection from non-farm development, provide increased protection from nuisance lawsuits and promote agriculture as a viable way of life in a heavily urbanized county. The VAD program is administered by the Forsyth Soil and Water Conservation District Board and staff. To become a VAD, an individual farm must contain a minimum of twenty acres and must participate in the County’s present-use value taxation program. Agricultural Tourism provisions provide a way of increasing the economic potential of agricultural land by allowing certain recreational, educational, entertainment or limited business activities to be operated on a bona-fide farm. These uses are allowed with certain limiting conditions, which are described in the Unified Development Ordinances (UDO). To utilize agricultural tourism, a farm must be located in a Voluntary Agricultural District and contain a minimum of twenty acres. Additionally, the Agricultural Tourism provisions are only available for property zoned AG (Agricultural) and YR (Yadkin River). The Western Rural Area Study was conducted in response to concerns about the potential loss of rural character in the western portion of the county. Geographic Information System (GIS) filter mapping analysis (looking at different physical characteristics of the land) was used to determine the future development potential of the area. 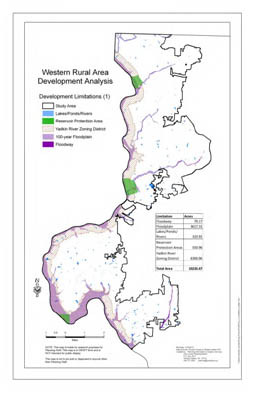 Land with development limitations such as steep slopes, poor soils, water features and existing development was mapped and separated from the remaining developable land. Based on this analysis, only 26% of the area could be easily developed in the future even if sewer were available. Through collaboration with the staffs of the City-County Utilities Commission and the Forsyth County Health Department, it was determined that the western rural area could not be efficiently served by gravity sewer, making suburban-density development not economically feasible. Due to these limitations, it was concluded that no additional regulations were needed at that time to maintain the current rural character of the area. As community health has become a bigger concern since the adoption of Legacy, there has been renewed interest in local agriculture as a way of providing greater access to healthy food across our county. As Chapter 8 (Healthy, Complete and Equitable Communities) of this document illustrates, the major factors identified as important in ensuring a community’s access to fresh, healthy food are protecting agricultural land on the edge of urban areas, facilitating forms of urban agriculture and establishing farmers’ markets and retail establishments that carry a variety of healthy, locally grown food. Also mentioned in Chapter 8 is the new concept of Community Supported Agriculture (CSA), which is a direct form of marketing where farms sell shares of their products to individuals, and distribute products either to designated drop-off sites or to customers’ homes. Concepts such as this help increase the economic viability of agricultural production in Forsyth County. Rural character has also benefited from the Area Plans which have been completed since the adoption of Legacy. The Rural Hall, Walkertown and Tobaccoville Area Plans, as well as the Clemmons and Lewisville Comprehensive Plans, all have some Rural Area within their Planning Area boundaries. Land use recommendations in these Plans are limited to very low-density and agricultural uses. Historic Resources staff has identified historic resources (both individual structures and larger districts) in each Planning Area, including the Rural Area. Recommendations exist for the preservation of these features, which helps ensure the long-term survival of rural character. Additionally, since the adoption of the 2001 Legacy Plan, rising energy costs and commute times have led more people to desire living closer in to the urban core of Winston-Salem. This has reduced demand for subdivisions in the Rural Area, protecting the existing agricultural character and open space in the area. These trends are predicted to continue and become more prevalent in the future.